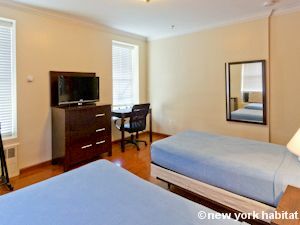 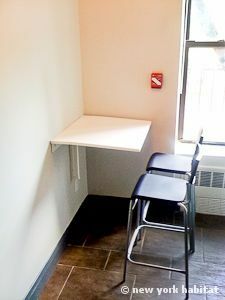 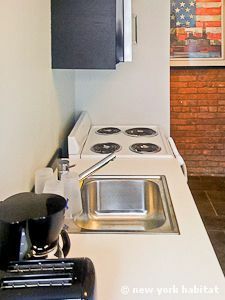 The room to rent is situated on West 99th Street and Broadway in Manhattan on the Upper West Side. The 1910 building has three main features: a representative on site available 24 hours, an elevator which gives access to the 7 floors of the building as well as coin-operated laundry. 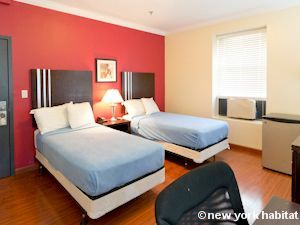 The room for rent has two single beds which will give you the opportunity to share with the person of your choice. 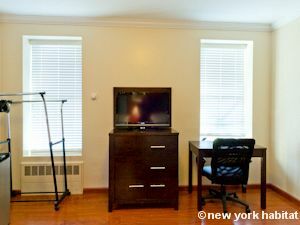 You can enjoy watching cable TV on the flat screen together. You can also go online independently thanks to the internet access . The room has an air conditioning unit to cool off during warm days. 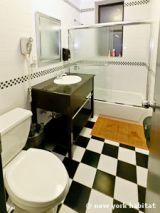 The kitchen and bathroom are shared. 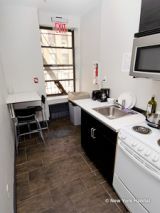 The kitchen facilities will allow every person of the 17 rooms of the floor to gather together during dinner time. Each person needs to bring their own kitchen supplies including pots, pans, glasses, plates and cutlery. 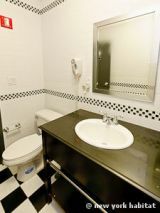 The 3 shared bathrooms are accessible between the residents of the 13 surrounding rooms. 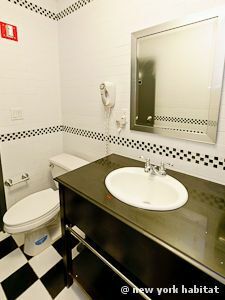 Please note that towels are not included. 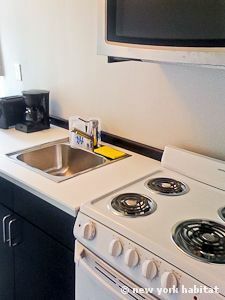 Please note that this furnished unit offers apartment-style accommodations with a communal kitchen environment. The occupant should not expect to have the same experience as a regular rental in a New York City residential apartment. 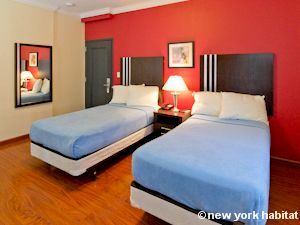 The room is situated in the residential neighborhood of Upper West Side, New York. If you do not feel like cooking, there are many places where you can order take-out, whether it be a pizzeria, a Chinese restaurant or a nearby deli. 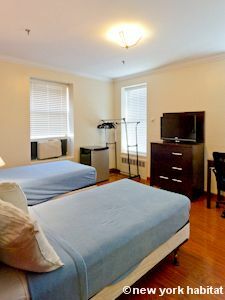 There are many outdoor activities: playing baseball on the outdoor diamonds in Central Park or indoor at the Baseball Center on West 74th Street; picnicking on the Great Lawn or seeing a marionette show at Swedish Cottage. 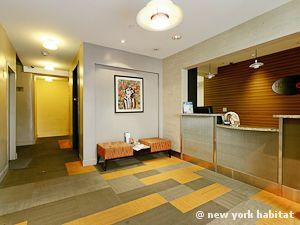 One other great attraction is the American Museum of National History, which has permanent exhibits and special events year-round. 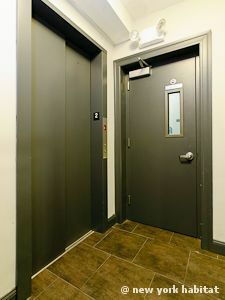 It is also important to note that depending on the room's placement within the building, some traffic noise from Broadway may travel into the unit. 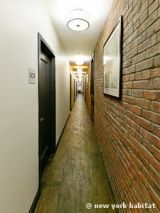 Please note that some noise can be heard in the rooms facing the street. 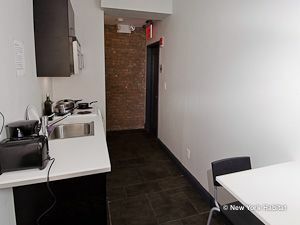 The closest subway station is 96th Street where you can entrance to the red line (1, 2, 3 lines).